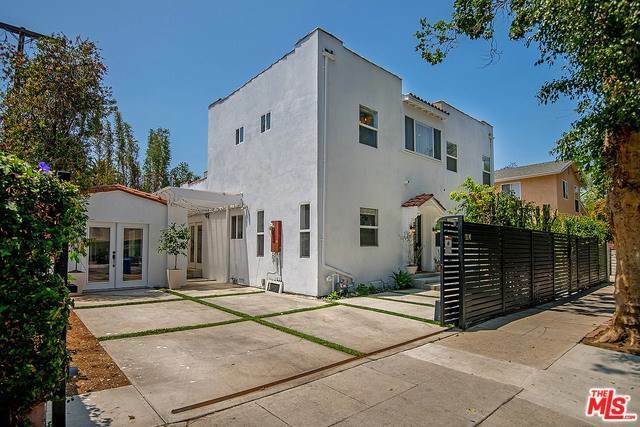 Newly renovated gated private two story home in the heart of West Hollywood. House is secured by brand new electronic steel gate with affixed Ring intercom system and mailbox. New engineered hardwood throughout, with carrera marble tiles in bathrooms. Entire second level is 800+ sq ft. master suite with large dual head waterfall shower, bath tub, built in vanity, and walk in closet. Kitchen has brand new top of the line stainless steel appliances, with beautiful quartz countertops and subway backsplash. Living room has an electric fireplace. Detached garage was converted into a landryroom/ office and is currently used as an office and laundryroom. Laundry hook ups also available in pantry closet under the stairs. Farm sink with built in reverse-osmosis water filter. Brand new landscaping with drip irrigation system, gas line for BBQ, and fire-pit. Driveway large enough for two car side-by-side parking. Lot Size: 0.07 Acres / 3201 Sq. Ft.
SchoolsClick map icons below to view information for schools near 7614 Willoughby Avenue West Hollywood, CA 90046. Listing provided courtesy of Persia Zarrabi, Keller Williams Beverly Hills. Home for sale at 7614 Willoughby Avenue West Hollywood, CA 90046. Description: The home at 7614 Willoughby Avenue West Hollywood, CA 90046 with the MLS Number 19432050 is currently listed at $1,600,000 and has been on the West Hollywood market for 72 days. You are viewing the MLS property details of the home for sale at 7614 Willoughby Avenue West Hollywood, CA 90046, which includes 3 bedrooms, 2 bathrooms and has approximately 1808 sq.ft. of living area.